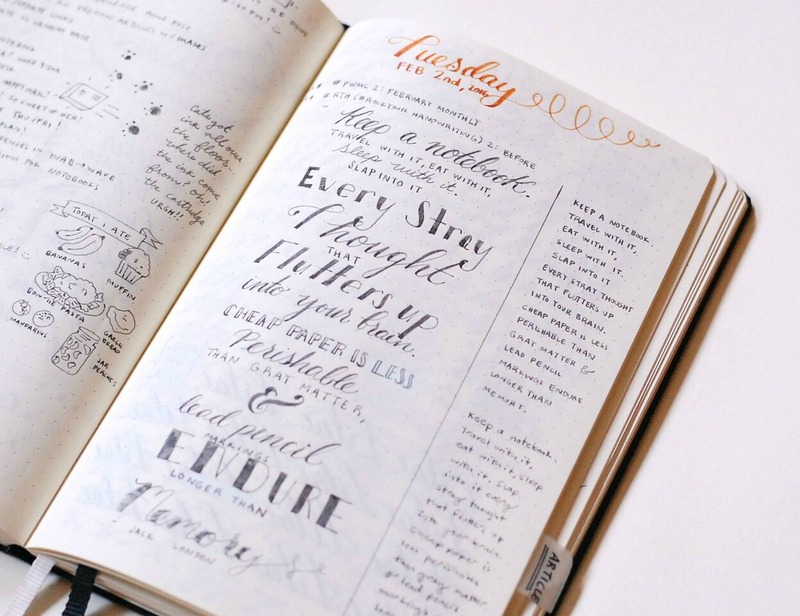 The Journal Diaries is a blog segment where we get a sneak peek into the journals, notebooks, organizers, and diaries from creatives all over the world. My special guest today is Kim based in California, USA. - Hi Kim, and welcome! Could you tell us a little more about yourself? Hi Michelle! I’m super excited to be here today! I live in the beautiful sunny San Diego. I blog and enjoy sharing ideas on my blog about the Bullet Journal, planning, and creative pursuits. I like helping others and coming up with ideas to help them get more out of their planning systems. I also leatherwork and am soon to open up an Etsy shop to sell leather and paper goods. I love everything that has to do with paper products. I’m an artist, writer, blogger, leatherworker, and I enjoy inspiring others to get to where they want to be in their lives and their systems. I enjoy writing, reading, calligraphy, writing letters, planning, creating, cooking, painting, drawing, playing my cats, watching Netflix, running, bodyweight exercises and much more. 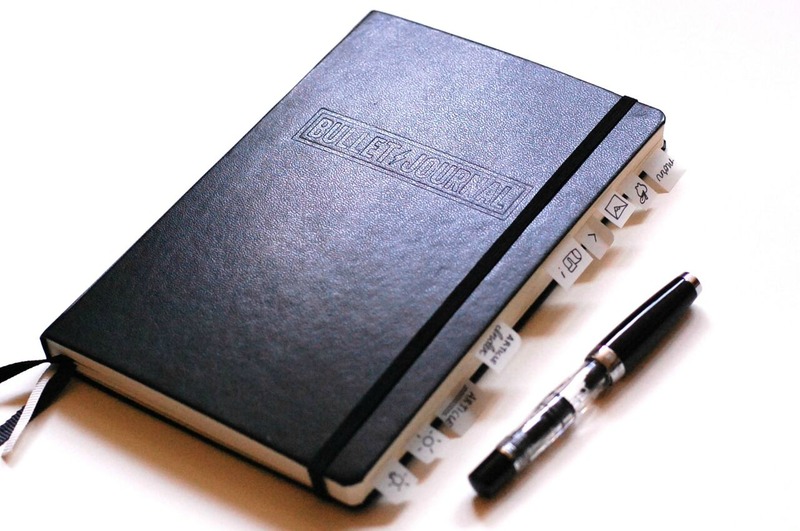 - Can you recall when you started using a daily planner for all of your organizational needs? In high school we were given planners and I used those to not only to write down assignments, but also the goings on of the day with conversations I had, observations I made, and things I was excited about. It was a week on two pages type of deal. When I went to college, I picked up the school brand’s version which was essentially the same layout. It wasn’t until my last semester in college that I got into the Bullet Journal. - What are some of the planner types (or brands) that you've used in the past? I used the ones my schools offered, I don’t remember the brands of those. Some years ago I first got into personal planning from seeing all of the lovely paper planners online so I dove in with grid paper in binders and then printables in discbounds. I bought some printables from the likes of Miss Tiina and I designed my own printables as well. I used discbounds for a long time, I enjoy their flexibility. When I first got into Bullet Journaling I tried out a lined Ecosystem notebook and later picked up a dotted Leuchtturm1917 after seeing it highly recommended in the Bullet Journal community online. I did try out a dotted Field Notes once while I waiting for a new Leuchtturm1917 to arrive as an intermediary Bullet Journal as well. Right now I’m using the official Bullet Journal Leuchtturm1917 that Ryder Carroll, inventor of the Bullet Journal, developed which I absolutely love because of all of the wonderful features that are built-in such as the Index, Future Log, and numbered pages. I really like how it’s dot grid because it gives me the perfect balance of freedom and structure. - Where you always pretty consistent with using your planners? I regrettably threw away all of my school planners in a haste to go paperless some years ago, so I can’t really remember much about those, but I think I always ended up going to printer paper to make study plans and lay out my assignments. When I was using the discbound system I had the tendency to spend more time designing printables than using them, so not too consistently, although there were quite a few that were extremely useful and I still use quite a few that I created in a few Jr. Arc discbounds. With the Bullet Journal, I became more consistent at using a planner type of system, even if I don’t use it every day, it’s there when I need it. It’s awesome because of how flexible of a system it is. It’s literally a notebook, cleverly organized, that you can add anything you want to the pages. 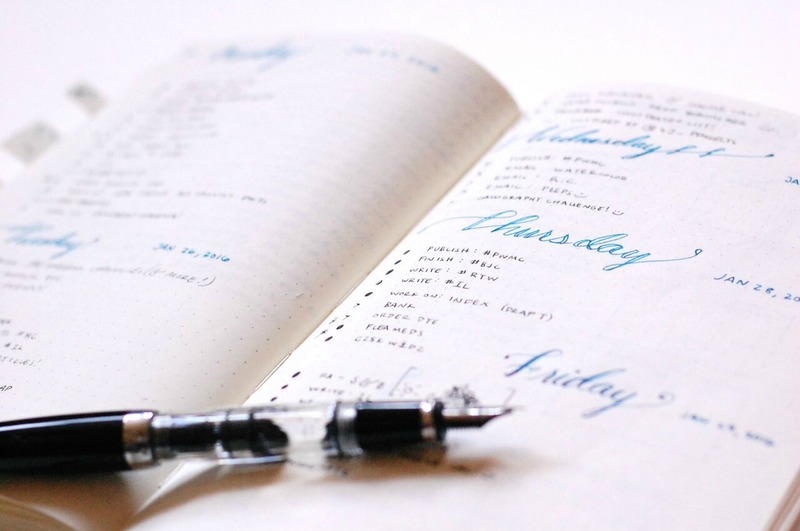 - What features do you look for, or favor the most, within a daily planner? I’m a creative, problem-solving type of thinker, so I need a system that allows me to think the way that I think. I need freedom to create, to think, and to draw out solutions to problems that I notice. No day is like the other and my Daily Logs are a reflection of my actual day-to-day life, thoughts, and ideas. That’s why I love the Bullet Journal system so much because you can apply the principles into any notebook of your choice and you pretty much set it up yourself however you want. With the Daily Logs you can use as much or as little room as you need to each day. In terms of features, I look for good paper quality that won’t bleed-through, can handle fountain pens, dot grid is a must, size, page numbers, built-in table of contents, elastic closure, colorful cover options, acid-free archival paper, and a solid build to last me years. 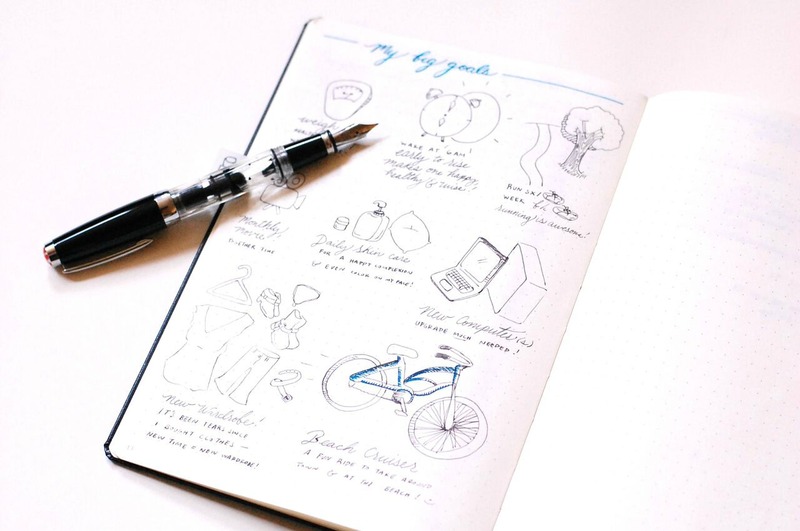 I reference old Bullet Journals all the time so Leuchtturm1917 is pretty much the only brand that fulfills all of these requirements in a beautifully designed product. I admire them as a company as well because of how they stand behind their company statement of, “details make all the difference,” they truly do! And I appreciate all of the thought that went into creating these beauties. - What got you into the bullet journaling system? And what do you enjoy most about it? 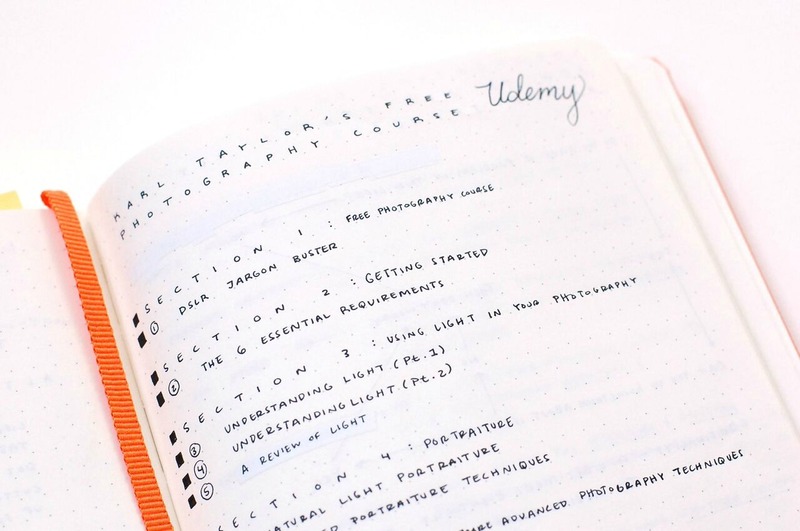 I was browsing around online looking around for ideas to help me organize my life which led to LifeHacker, Pinterest, and ultimately to one of the many Bullet Journal communities online. I love how simple the guidelines are and how easy it is to customize it to your specific needs according to your life at the time. The flexibility is one of my favorite components and I relish the notebook aspect of it to create simple and useful Collections. Collections are where you can add in notes, flesh out ideas, outline articles - anything you want to really. - In what ways, would you say, has it helped you? It’s helped me in so many ways! 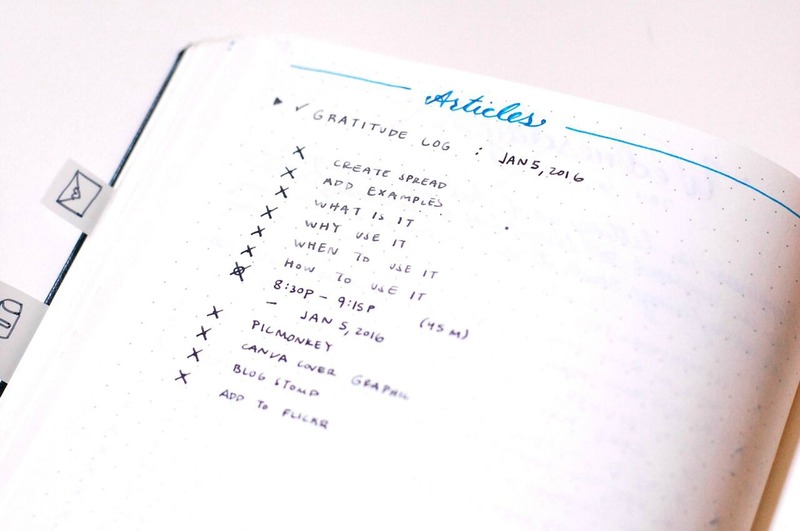 Off the top of my head: helped me gain focus through the Daily Logs, break down my goals into achievable steps with Collections, keep track of what’s important to me, improve my handwriting, allows me an open space to think, become happier with the creation of the Gratitude Log I developed, and so much more! It really is the best thing ever. 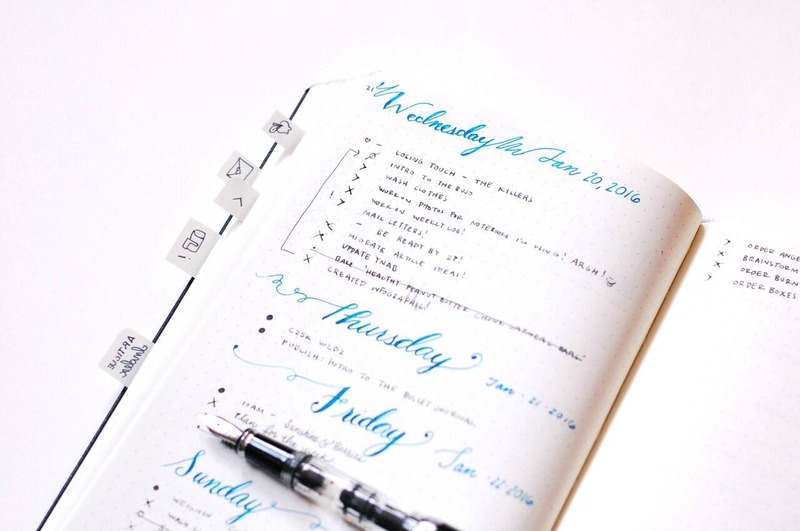 - What's your planner of choice for your bullet journaling system? I really love the dotted Leuchtturm1917 notebooks. They have a solid build and the pages are luxurious enough to use my beloved fountain pens with. Right now I’m really enjoying the official Bullet Journal Leuchtturm1917 because of the extra page for the Index, and the instructions within to read through as a refresher from time to time. - What sort of things do you record within your bullet journal? In a word: everything! I keep track of my schedule, tasks, gratitude log, waiting on, shipment tracker, article outlines, project notes and sketches, wishlists, pen pal information, exercise, tv show air dates, movies to watch, books to read, meeting notes, article notes, random notes, ideas, and much more! The Bullet Journal is a system to record all things, so I tend to use it as such. I stick to the original guidelines pretty closely for the most part and add in my own flair, because that’s part of the fun! 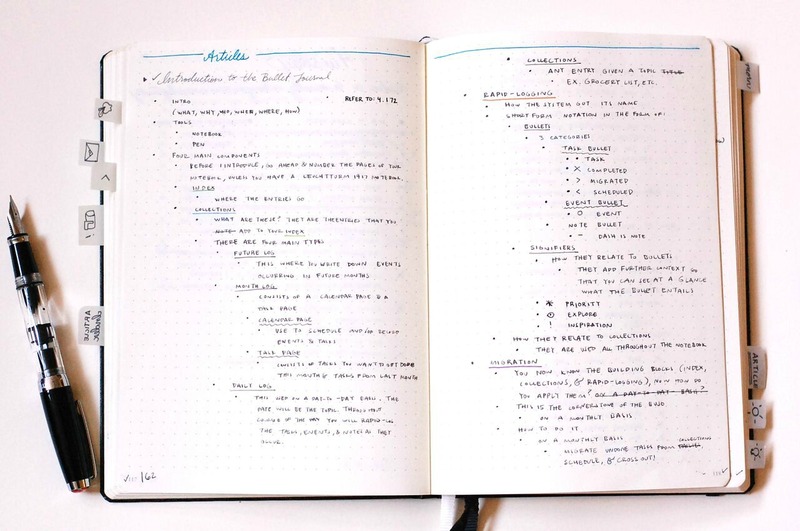 The four main parts of the Bullet Journal are: The Index (to organize the contents of the notebook), Collections (Daily Log, Monthly Log, Future Log, and other types), Rapid-logging (Bullets and Signifiers to jot down tasks, events, notes, and to give the bullets further context), and Migration. 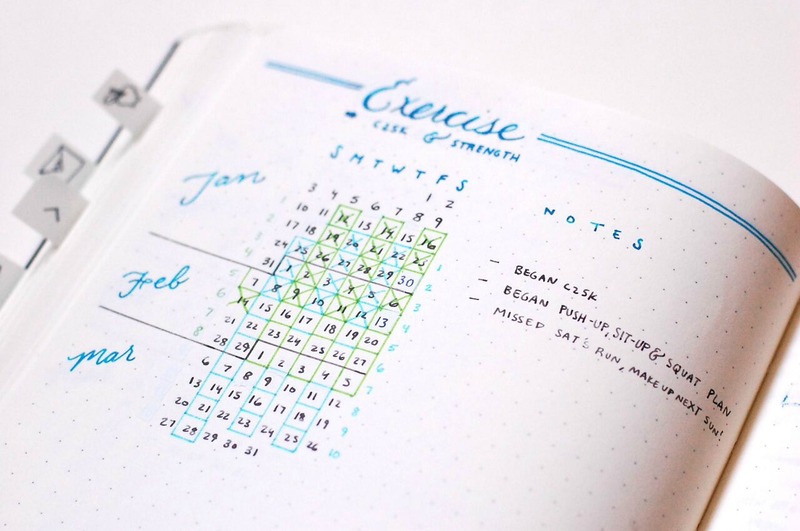 The way the Bullet Journal is outlined is a very wonderfully unique and adaptable analog system. 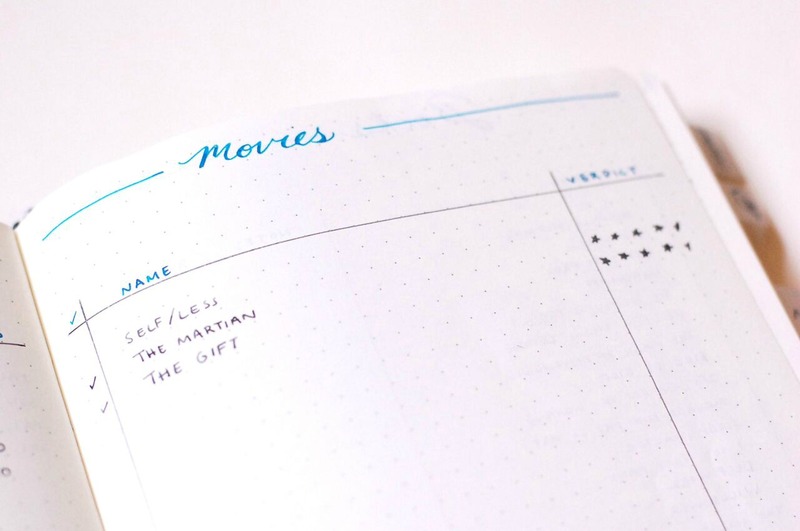 - Do you use one main planner for everything, or are there different ones for different things (such as work, finances, projects, business, day-to-day errands, etc)? I have two main Bullet Journals that I use. One is my everyday Bullet Journal where I keep track of personal things and some collections with work-related content. The other is for my Blog & Business Bullet Journal to keep track of all of the information I want to keep track of over the course of the year in regards to that aspect of my life. 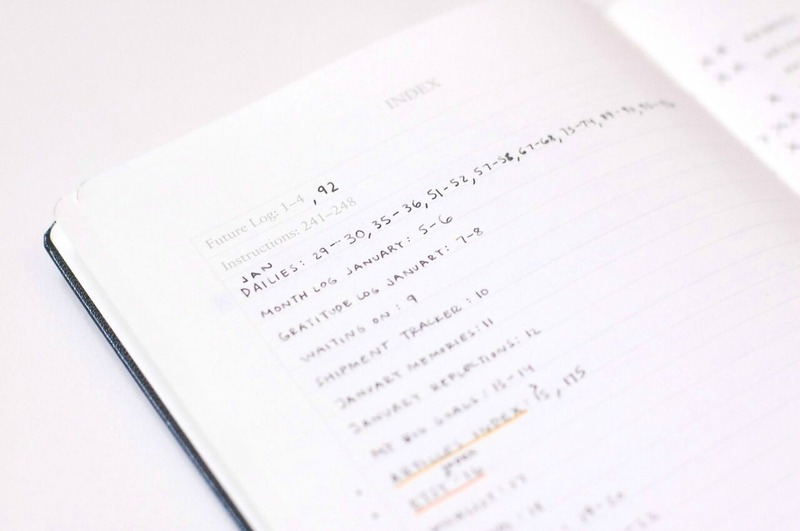 I have some collections that are blog and business-related that seep into my everyday Bullet Journal such as article action steps and notes which would fill up the dedicated one quickly if I were to have those in there. I keep both work and personal tasks in my Daily Logs so I don’t over-schedule myself and can have everything at a glance. 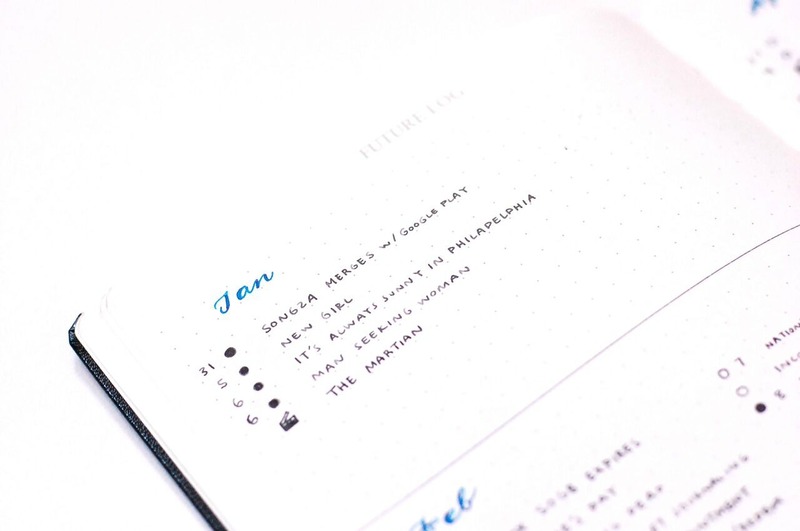 - What time of the day do you find yourself using your planner the most? I use it throughout the day. I usually use it most often when I’m at my desk, which is most of the day. I’d have to say in the morning and afternoon are when I most actively work with it and in the evenings are when I think about the plans for the following day’s Daily Log and add in my reflections of the day to the Monthly Log, Gratitude Log, and possibly the Awesome Moments collection. 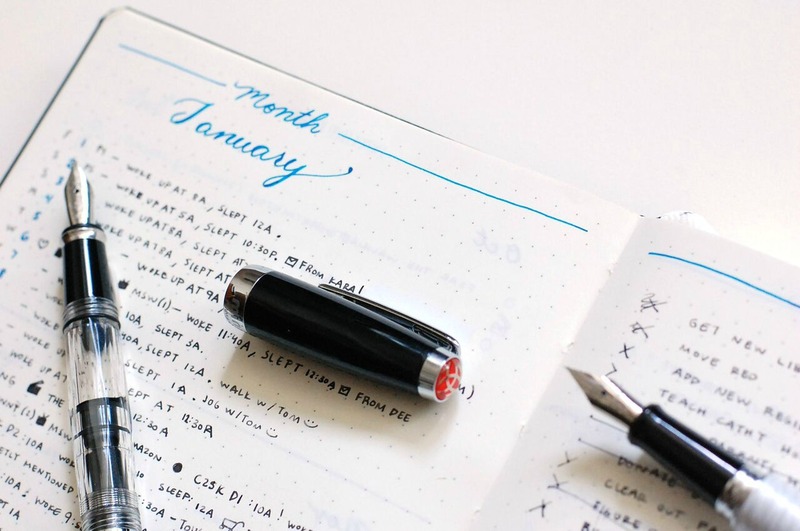 - What types of pen do you prefer using with your bullet journal, and why? In the past I enjoyed using eraseable FriXion pens, Staedtlers, and gel pens such as the Pilot G-Tec C4 and Pentel Hybrid Technica 04, but since I was gifted a fine nib Mini TWSBI 580 fountain pen for Christmas, I can’t put it down and find myself using it as an everyday pen filled with the beautiful Faber-Castell Stone Grey ink. I love using another fountain pen as an accent pen to add colorful headers that pop a bit. The two that are currently inked up for this purpose are my Cross Bailey with Waterman Inspired Blue and Pilot Plumix with Diamine Blaze Orange. I love these colorful inks on wider nibs because the shading is fantastic. I also recently get a fine nib Pilot Metropolitan that I absolutely adore, I switch between it and the TWSBI as my everyday writers. I would recommend the fine nib Pilot Metropolitan to anyone looking to get into fountain pens. - Do you have an all-time favorite pen that you just can't live without? I absolutely LOVE my Pilot Vanishing Point. It was a birthday present from my wonderful boyfriend last year and it is absolutely lovely. I mean, it’s a click fountain pen that writes well, can’t get any better than that! I adore it and use it more for personal journaling than in my Bullet Journal. - What motivates you to stick with using you paper planner, and what do you enjoy most about it, especially in this digital world that we live in? I love using it because it is amazing! Seriously, it allows me to be completely myself with it. I can simply turn the page and create any idea that I come up with. I love that I am the creator of anything that goes into it (with guidance from the original system and inspiration from others, of course!). I love the analog nature of it. It allows me to slow down and be present with the words and focus only on those without the myriad of distractions that are present in a digital system. It’s also fast enough that I can open and jot down a thought before it disappears. I can stay focused by the simple nature of it. I can be fully present with it and take a moment for myself. It’s absolutely wonderful. - What would you say are some of the pros, in terms of your personal experience, in using a paper planner vs a digital one? I like that the notebook bends to my needs rather than having to adjust to the confines of a digital system. 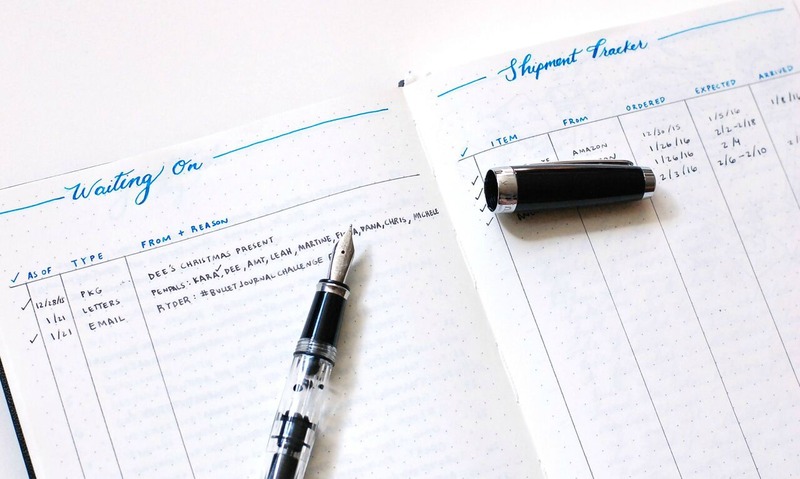 Don’t get me wrong, I think digital planning systems can work beautifully alongside the Bullet Journal (I use Google Calendar and Tick Tick alongside mine), but I think the main thing that makes analog better over digital is how personal it is. With a digital system, no matter how many tweaks you make, it’s still going to look exactly as it was designed. 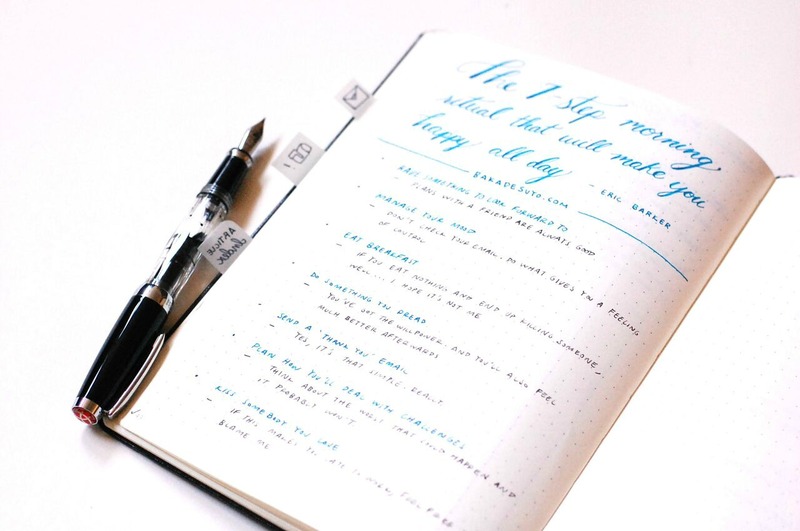 With the Bullet Journal, you can use it and make it look however you need to in order to stay productive. 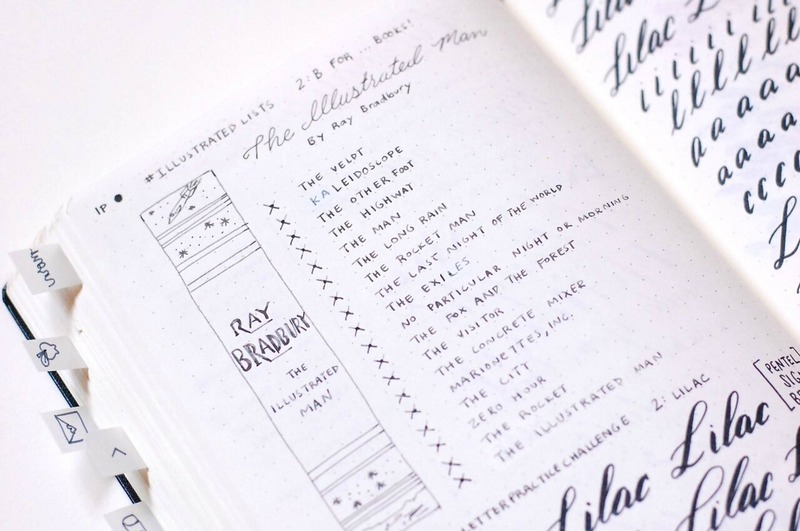 The uniqueness of everyone’s Bullet Journal is mind-boggling and wonderful. There is so much to be gained from learning from each other and how we each use our Bullet Journal. Besides the personality you can inject into it, I’d have to say the biggest win is that it helps me focus. I’m pretty scatter-brained with a million ideas buzzing around in my head at all times and I constantly feel pulled in different directions. With the Bullet Journal, it is something that waits for me to be ready to use it and if I put it down, the same blank page is waiting for me to write something down whenever I’m ready. I can create an outline for my day and follow it peacefully without any distractions. I can flip to another page and sketch out some ideas. I am able to flip between pages for different information without getting overwhelmed. It’s a system that works the way I think. 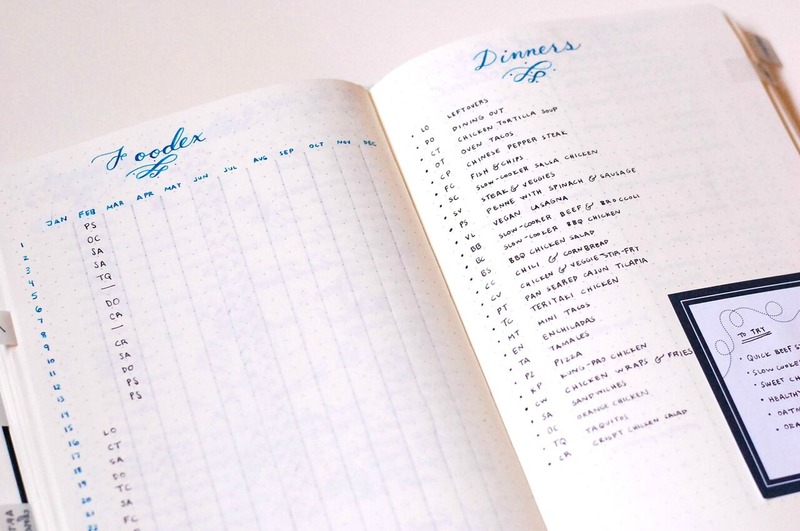 It’s lovely and the genius way that Ryder Carroll, the inventor of the Bullet Journal, crafted and pieced together its various components to organize your thoughts is phenomenal. I’m in awe of it every day and love spending time in my Bullet Journal and getting things done. - What advice, or suggestions, could you offer for those interested in using a daily planner themselves? 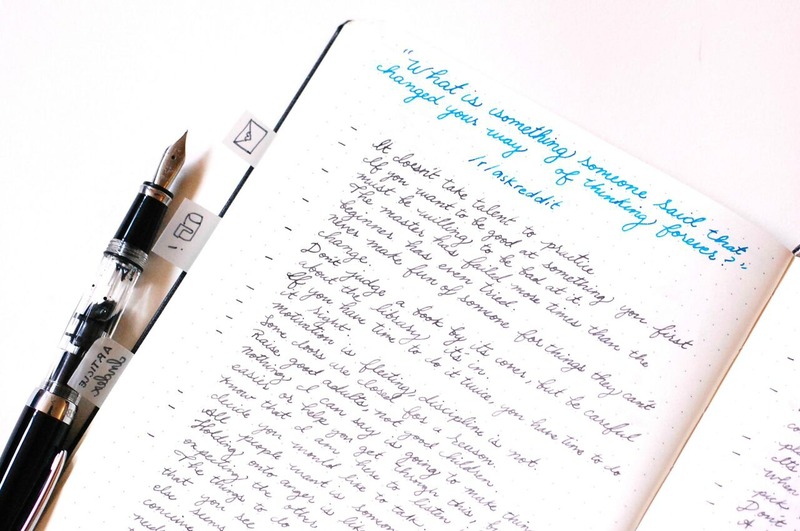 Think about what you want to keep track of in your planner or Bullet Journal. Giving your planning system purpose will help you craft the elements to make it your own. Start by writing down a list of your values and interests and what you’d like to add to your daily planning system. Next, watch the video on BulletJournal.com and dive in! If you’re afraid of starting or ruining a page, think of it all as an experiment to learn from. Keep it simple, if you’re feeling overwhelmed, pare back down to basics. Experiment in order to keep it all organized the way that makes sense for you. Don’t worry about comparing your pages to someone else, the important thing is that your system works for YOU, no matter what it looks like. Above all, it must be something that helps you get things done, regardless of what it looks like. 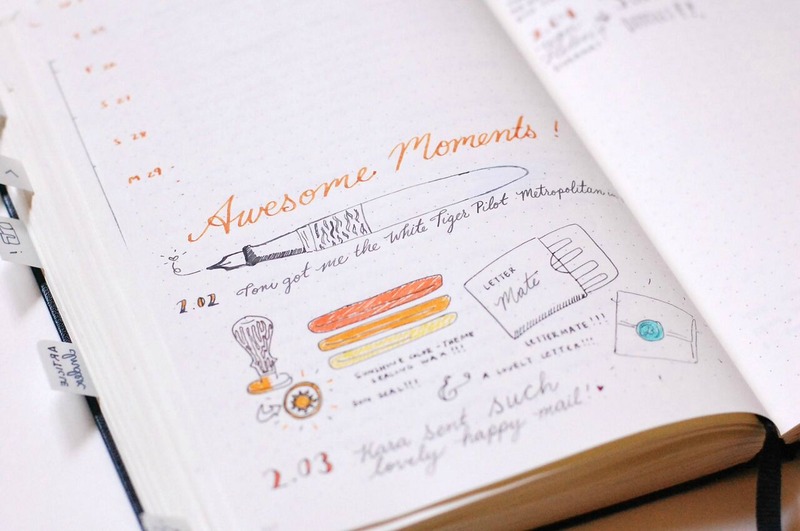 If you decide to take the plunge, then welcome to the amazing world of the Bullet Journal! 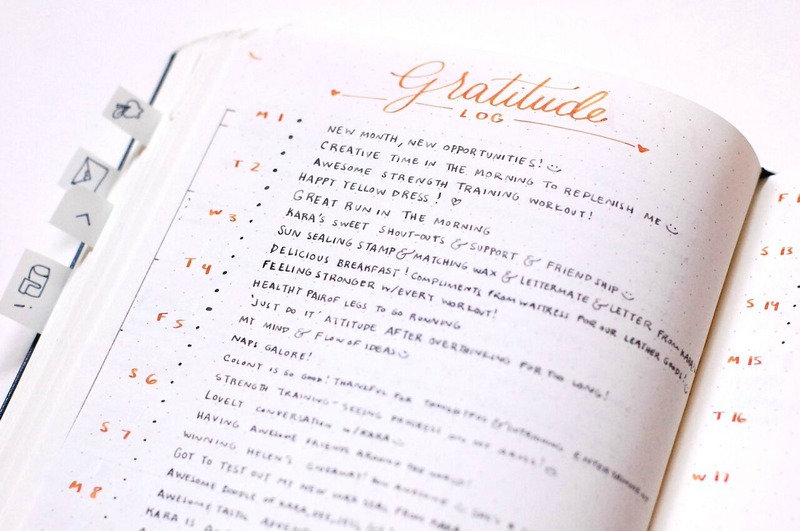 Thank you so much, Kim, for sharing your Bullet Journal with us! I really loved reading this!!! I've been reading around on how the Bullet Journal works for others and am so happy to see how others work in their notebooks. Beautifully done! Thank you so much for the lovely interview, Michelle! I had a blast :D I hope your readers find it helpful and give the Bullet Journal a try! Wow! Incredibly neat and organised. This is a serious goal right here. Thanks for the interview, and thanks, Kim, for sharing! Awesome interview! More ideas to work with....I love bullet journals! Absolutely love the color of the blue ink!!! Now that's one organize person, if we are like Kim, we should have our own journal so we can keep track of our daily activities and keep note of sites such as http://www.lordofpapers.com/term-paper-help which can help us with our term paper requirements. Awesome post!I love the idea of a Gratitude.Thank you for the valuable information on this tips.